Hanukkah gelt, sufganiyot, fried desserts and holiday-themed cookies usually get all of the attention during the Festival of Lights. But with eight nights to celebrate, there's plenty of time to try something new. 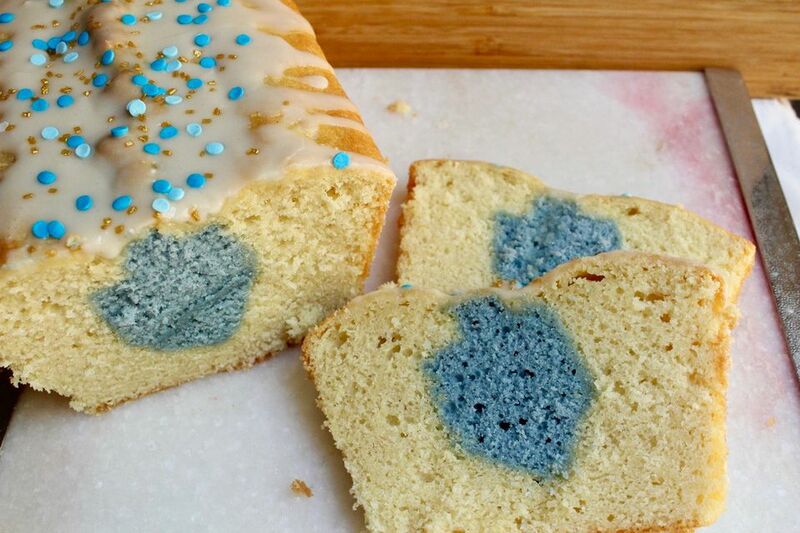 Slice into this vanilla pound cake loaf to reveal an impressive surprise - a contrasting dreidel shape baked right in! Making the cake is pretty straightforward, though it does take some time. But the results have a big enough wow factor that if you're feeling crafty, this makes a fun option for DIY gift giving. Need a visual assist? These step-by-step photo instructions will walk you through assembling a surprise loaf cake. Preheat the oven to 350 F. Lightly grease a 9x9x2-inch baking pan. Line the bottom of the pan with parchment paper and set aside. In another bowl, use an electric mixer or wooden spoon to cream together the butter and sugar. Add the egg and vanilla extract, and beat until well mixed. Alternate adding the flour mixture and milk in two or three additions, mixing well after each addition. Stir just until the batter is smooth. Add the blue food coloring a few drops at a time, stirring well, and adding additional coloring until you achieve the shade you prefer. Pour the batter into the prepared pan. Use a spatula to carefully smooth the batter to the edges of the pan. (The batter will be thick, so take care not to dislodge the parchment paper.) Bake in the preheated oven for 18 to 20 minutes, or until a tester inserted in the center comes out clean. Set the dreidels aside while you mix the white cake batter. Grease a 9x5-inch loaf pan. Line the bottom with a piece of parchment paper and set aside. In another large bowl, use an electric mixer or wooden spoon to cream together the butter and sugar. Alternate adding the flour mixture and milk in two or three additions, mixing well after each addition. Stir just until the batter is smooth, then pour just enough into the prepared pan to cover the bottom. Arrange the cake dreidels, down the center of the loaf pan, placing them flush against each other so they fill the length of the pan. Carefully spoon the white batter into the pan, so that the dreidel "log" is surrounded and covered by batter. Place the loaf pan in the center of the preheated oven (if your pan looks full, you may want to place it on a sheet of foil to catch any drips). Transfer the pan to a wire rack and allow the cake to cool for 20 minutes. Remove from the pan, and cool completely. In a small bowl, whisk together the confectioners sugar, milk, and lemon juice until smooth, adding a little more sugar if the glaze feels runny. When the cake is completely cool, drizzle the top with the glaze. Decorate with sprinkles if desired. Serve and enjoy after your Hanukkah meal!